News and Product Info : Vapor Technologies Inc.
","location='../../../../index.cfm/lev1/10'"); mm_menu_1_0.addMenuItem("Steel Systems","location='../../../../products/?act=pdπd=65'"); mm_menu_1_0.addMenuItem("Light Industrial Units","location='../../../../products/?act=pdπd=64'"); mm_menu_1_0.addMenuItem("Heavy-Duty FRP Units","location='../../../../products/?act=pdπd=66'"); mm_menu_1_0.addMenuItem("Venturi Scrubbers","location='../../../../products/?act=pdπd=931'"); mm_menu_1_0.addMenuItem("Frac-Tank Scrubbers","location='../../../../products/?act=pdπd=930'"); mm_menu_1_0.addMenuItem("Trailer Mounted Vacuum Truck Units","location='../../../../products/?act=pdπd=826'"); mm_menu_1_0.addMenuItem("Chassis Mounted Vapor Scrubber Units","location='../../../../products/?act=pdπd=917'"); mm_menu_1_0.addMenuItem("High Volume Scrubbers","location='../../../../products/?act=pdπd=852'"); mm_menu_1_0.addMenuItem("E6500-R3K Trailer Mounted System","location='../../../../products/?act=pdπd=946'"); mm_menu_1_0.hideOnMouseOut = true; mm_menu_1_0.childMenuIcon = ""; mm_menu_1_0.bgColor = "#dcebe0"; mm_menu_1_0.menuBorder = 1; mm_menu_1_0.menuLiteBgColor = "#70907f"; mm_menu_1_0.menuBorderBgColor = "#dcebe0"; window.mm_menu_2_0 = new Menu("root",202,24,"","11","#ffffff","#ffffff","#70907f","#99b0a5","left","middle",3,1,300,1,0,true,true,true,0,true,true); // mm_menu_2_0.addMenuItem("
","location='../../../../index.cfm/lev1/911'"); mm_menu_2_0.addMenuItem("Eliminator 450 Scrubber System","location='../../../../products/?act=pdπd=910'"); mm_menu_2_0.addMenuItem("Eliminator 550-304S Scrubber System","location='../../../../products/?act=pdπd=918'"); mm_menu_2_0.addMenuItem("Eliminator 500-1KR Scrubber System","location='../../../../products/?act=pdπd=912'"); mm_menu_2_0.addMenuItem("Eliminator 5500 Scrubber System","location='../../../../products/?act=pdπd=909'"); mm_menu_2_0.hideOnMouseOut = true; mm_menu_2_0.childMenuIcon = ""; mm_menu_2_0.bgColor = "#dcebe0"; mm_menu_2_0.menuBorder = 1; mm_menu_2_0.menuLiteBgColor = "#70907f"; mm_menu_2_0.menuBorderBgColor = "#dcebe0"; window.mm_menu_3_0 = new Menu("root",202,24,"","11","#ffffff","#ffffff","#70907f","#99b0a5","left","middle",3,1,300,1,0,true,true,true,0,true,true); // mm_menu_3_0.addMenuItem("
","location='../../../../index.cfm/lev1/805'"); mm_menu_3_0.addMenuItem("VT50PM-200 Scrubber with Blower","location='../../../../products/?act=pdπd=808'"); mm_menu_3_0.addMenuItem("PES30-18 Micro Scrubber","location='../../../../products/?act=pdπd=939'"); mm_menu_3_0.addMenuItem("PES65-12 Vapor Scrubber","location='../../../../products/?act=pdπd=809'"); mm_menu_3_0.addMenuItem("PPT-24 Twin Column Scrubber","location='../../../../products/?act=pdπd=944'"); mm_menu_3_0.addMenuItem("PES225-18 Scrubber","location='../../../../products/?act=pdπd=71'"); mm_menu_3_0.addMenuItem("PPS-24 Vapor Scrubber System","location='../../../../products/?act=pdπd=943'"); mm_menu_3_0.addMenuItem("FRPS200-12 Scrubber System","location='../../../../products/?act=pdπd=938'"); mm_menu_3_0.hideOnMouseOut = true; mm_menu_3_0.childMenuIcon = ""; mm_menu_3_0.bgColor = "#dcebe0"; mm_menu_3_0.menuBorder = 1; mm_menu_3_0.menuLiteBgColor = "#70907f"; mm_menu_3_0.menuBorderBgColor = "#dcebe0"; window.mm_menu_4_0 = new Menu("root",202,24,"","11","#ffffff","#ffffff","#70907f","#99b0a5","left","middle",3,1,300,1,0,true,true,true,0,true,true); // mm_menu_4_0.addMenuItem("
","location='../../../../index.cfm/lev1/54'"); mm_menu_4_0.addMenuItem("SST-40 Vapor Scrubbing System","location='../../../../products/?act=pdπd=63'"); mm_menu_4_0.addMenuItem("SSTR-54 Triple Column Scrubber","location='../../../../products/?act=pdπd=53'"); mm_menu_4_0.addMenuItem("SST-20 Stainless Vapor Scrubber","location='../../../../products/?act=pdπd=827'"); mm_menu_4_0.addMenuItem("PPS-24 Poly Rental Scrubber","location='../../../../products/?act=pdπd=807'"); mm_menu_4_0.addMenuItem("PPT-24 Poly Rental Scrubber","location='../../../../products/?act=pdπd=945'"); mm_menu_4_0.addMenuItem("FRPT-30 FRP Vapor Scrubber","location='../../../../products/?act=pdπd=926'"); mm_menu_4_0.addMenuItem("Eliminator 550-304S Scrubber","location='../../../../products/?act=pdπd=920'"); mm_menu_4_0.addMenuItem("Eliminator 500-1KR Scrubber System","location='../../../../products/?act=pdπd=913'"); mm_menu_4_0.addMenuItem("Eliminator 5500 Scrubber Unit","location='../../../../products/?act=pdπd=851'"); mm_menu_4_0.hideOnMouseOut = true; mm_menu_4_0.childMenuIcon = ""; mm_menu_4_0.bgColor = "#dcebe0"; mm_menu_4_0.menuBorder = 1; mm_menu_4_0.menuLiteBgColor = "#70907f"; mm_menu_4_0.menuBorderBgColor = "#dcebe0"; window.mm_menu_5_0 = new Menu("root",202,24,"","11","#ffffff","#ffffff","#70907f","#99b0a5","left","middle",3,1,300,1,0,true,true,true,0,true,true); // mm_menu_5_0.addMenuItem("
","location='../../../../index.cfm/lev1/93'"); mm_menu_5_0.addMenuItem("NOVAC 750 Carbon Adsorber","location='../../../../products/?act=pdπd=940'"); mm_menu_5_0.addMenuItem("NOVAC 1000 Carbon Vessel","location='../../../../products/?act=pdπd=828'"); mm_menu_5_0.addMenuItem("NOVAC 2000 Carbon Vessel","location='../../../../products/?act=pdπd=949'"); mm_menu_5_0.addMenuItem("R4K Radial Carbon Adsorber","location='../../../../products/?act=pdπd=935'"); mm_menu_5_0.addMenuItem("1KR Carbon Vessel","location='../../../../products/?act=pdπd=932'"); mm_menu_5_0.addMenuItem("VP-55 Vapor Phase Carbon Adsorber","location='../../../../products/?act=pdπd=15'"); mm_menu_5_0.addMenuItem("VP-55 with Venturi Air Induction","location='../../../../products/?act=pdπd=14'"); mm_menu_5_0.addMenuItem("VP55D Carbon Adsorber for H2S","location='../../../../products/?act=pdπd=813'"); mm_menu_5_0.addMenuItem("VP55A Carbon Adsorber for Ammonia","location='../../../../products/?act=pdπd=814'"); mm_menu_5_0.addMenuItem("AIR TECH 55 Venturi Air Induction Unit","location='../../../../products/?act=pdπd=16'"); mm_menu_5_0.hideOnMouseOut = true; mm_menu_5_0.childMenuIcon = ""; mm_menu_5_0.bgColor = "#dcebe0"; mm_menu_5_0.menuBorder = 1; mm_menu_5_0.menuLiteBgColor = "#70907f"; mm_menu_5_0.menuBorderBgColor = "#dcebe0"; window.mm_menu_6_0 = new Menu("root",202,24,"","11","#ffffff","#ffffff","#70907f","#99b0a5","left","middle",3,1,300,1,0,true,true,true,0,true,true); // mm_menu_6_0.addMenuItem("
","location='../../../../index.cfm/lev1/941'"); mm_menu_6_0.addMenuItem("NOVAC 750 Carbon Adsorber","location='../../../../products/?act=pdπd=941'"); mm_menu_6_0.addMenuItem("NOVAC 1000 Carbon Vessel","location='../../../../products/?act=pdπd=850'"); mm_menu_6_0.addMenuItem("NOVAC 2000 Carbon Vessel","location='../../../../products/?act=pdπd=98'"); mm_menu_6_0.addMenuItem("R4K Radial Carbon Adsorber","location='../../../../products/?act=pdπd=936'"); mm_menu_6_0.addMenuItem("Large Carbon Vessels","location='../../../../products/?act=pdπd=99'"); mm_menu_6_0.hideOnMouseOut = true; mm_menu_6_0.childMenuIcon = ""; mm_menu_6_0.bgColor = "#dcebe0"; mm_menu_6_0.menuBorder = 1; mm_menu_6_0.menuLiteBgColor = "#70907f"; mm_menu_6_0.menuBorderBgColor = "#dcebe0"; window.mm_menu_7_0 = new Menu("root",202,24,"","11","#ffffff","#ffffff","#70907f","#99b0a5","left","middle",3,1,300,1,0,true,true,true,0,true,true); // mm_menu_7_0.addMenuItem("
","location='../../../../index.cfm/lev1/937'"); mm_menu_7_0.addMenuItem("1500 CFM Steel Blower","location='../../../../products/?act=pdπd=95'"); mm_menu_7_0.addMenuItem("RB1200 Pressure Blower","location='../../../../products/?act=pdπd=921'"); mm_menu_7_0.addMenuItem("STORM 14 Poly Blower","location='../../../../products/?act=pdπd=934'"); mm_menu_7_0.addMenuItem("100% Poly Blowers","location='../../../../products/?act=pdπd=829'"); mm_menu_7_0.addMenuItem("Pneumatic Venturi Blowers","location='../../../../products/?act=pdπd=830'"); mm_menu_7_0.addMenuItem("Coppus Blowers","location='../../../../products/?act=pdπd=831'"); mm_menu_7_0.addMenuItem("Carbon Drum Blower (Air)","location='../../../../products/?act=pdπd=942'"); mm_menu_7_0.hideOnMouseOut = true; mm_menu_7_0.childMenuIcon = ""; mm_menu_7_0.bgColor = "#dcebe0"; mm_menu_7_0.menuBorder = 1; mm_menu_7_0.menuLiteBgColor = "#70907f"; mm_menu_7_0.menuBorderBgColor = "#dcebe0"; window.mm_menu_8_0 = new Menu("root",202,24,"","11","#ffffff","#ffffff","#70907f","#99b0a5","left","middle",3,1,300,1,0,true,true,true,0,true,true); // mm_menu_8_0.addMenuItem("
","location='../../../../index.cfm/lev1/801'"); mm_menu_8_0.addMenuItem("Activated Carbon Media","location='../../../../products/?act=pdπd=801'"); mm_menu_8_0.addMenuItem("KOH Carbon Media","location='../../../../products/?act=pdπd=802'"); mm_menu_8_0.addMenuItem("High Efficiency H2S Carbon","location='../../../../products/?act=pdπd=822'"); mm_menu_8_0.addMenuItem("Ammonia Adsorbing Carbon","location='../../../../products/?act=pdπd=824'"); mm_menu_8_0.addMenuItem("VTCM II","location='../../../../products/?act=pdπd=846'"); mm_menu_8_0.addMenuItem("VTCM-IPP","location='../../../../products/?act=pdπd=847'"); mm_menu_8_0.addMenuItem("VTCM IPSp","location='../../../../products/?act=pdπd=848'"); mm_menu_8_0.hideOnMouseOut = true; mm_menu_8_0.childMenuIcon = ""; mm_menu_8_0.bgColor = "#dcebe0"; mm_menu_8_0.menuBorder = 1; mm_menu_8_0.menuLiteBgColor = "#70907f"; mm_menu_8_0.menuBorderBgColor = "#dcebe0"; window.mm_menu_9_0 = new Menu("root",202,24,"","11","#ffffff","#ffffff","#70907f","#99b0a5","left","middle",3,1,300,1,0,true,true,true,0,true,true); // mm_menu_9_0.addMenuItem("
","location='../../../../index.cfm/lev1/914'"); mm_menu_9_0.addMenuItem("BIO-SCRUB X","location='../../../../products/?act=pdπd=811'"); mm_menu_9_0.addMenuItem("BSX50-EVT6","location='../../../../products/?act=pdπd=928'"); mm_menu_9_0.addMenuItem("EZ-STRIP SS","location='../../../../products/?act=pdπd=810'"); mm_menu_9_0.addMenuItem("CARBONIL XT","location='../../../../products/?act=pdπd=925'"); mm_menu_9_0.addMenuItem("CARBONIL ST","location='../../../../products/?act=pdπd=948'"); mm_menu_9_0.addMenuItem("CARBONIL ES","location='../../../../products/?act=pdπd=924'"); mm_menu_9_0.addMenuItem("ENVIRO-SCRUB VT","location='../../../../products/?act=pdπd=821'"); mm_menu_9_0.addMenuItem("ENVIRO-SCRUB VT (6% SOLUTION)","location='../../../../products/?act=pdπd=922'"); mm_menu_9_0.addMenuItem("VAMSOL 40","location='../../../../products/?act=pdπd=919'"); mm_menu_9_0.addMenuItem("SULFUR SCRUB 43","location='../../../../products/?act=pdπd=923'"); mm_menu_9_0.hideOnMouseOut = true; mm_menu_9_0.childMenuIcon = ""; mm_menu_9_0.bgColor = "#dcebe0"; mm_menu_9_0.menuBorder = 1; mm_menu_9_0.menuLiteBgColor = "#70907f"; mm_menu_9_0.menuBorderBgColor = "#dcebe0"; window.mm_menu_10_0 = new Menu("root",202,24,"","11","#ffffff","#ffffff","#70907f","#99b0a5","left","middle",3,1,300,1,0,true,true,true,0,true,true); // mm_menu_10_0.addMenuItem("
","location='../../../../index.cfm/lev1/915'"); mm_menu_10_0.addMenuItem("CARBONIL XT","location='../../../../products/?act=pdπd=13'"); mm_menu_10_0.addMenuItem("CARBONIL ST","location='../../../../products/?act=pdπd=24'"); mm_menu_10_0.addMenuItem("CARBONIL","location='../../../../products/?act=pdπd=49'"); mm_menu_10_0.addMenuItem("CARBONIL ES","location='../../../../products/?act=pdπd=853'"); mm_menu_10_0.hideOnMouseOut = true; mm_menu_10_0.childMenuIcon = ""; mm_menu_10_0.bgColor = "#dcebe0"; mm_menu_10_0.menuBorder = 1; mm_menu_10_0.menuLiteBgColor = "#70907f"; mm_menu_10_0.menuBorderBgColor = "#dcebe0"; window.mm_menu_11_0 = new Menu("root",202,24,"","11","#ffffff","#ffffff","#70907f","#99b0a5","left","middle",3,1,300,1,0,true,true,true,0,true,true); // mm_menu_11_0.addMenuItem("
","location='../../../../index.cfm/lev1/6'"); mm_menu_11_0.addMenuItem("MERCAPTOLYTE 200","location='../../../../products/?act=pdπd=6'"); mm_menu_11_0.addMenuItem("EZ-STRIP SS","location='../../../../products/?act=pdπd=929'"); mm_menu_11_0.addMenuItem("ENVIRO-SCRUB VT","location='../../../../products/?act=pdπd=819'"); mm_menu_11_0.addMenuItem("ENVIRO-SCRUB VT (6% Solution)","location='../../../../products/?act=pdπd=927'"); mm_menu_11_0.hideOnMouseOut = true; mm_menu_11_0.childMenuIcon = ""; mm_menu_11_0.bgColor = "#dcebe0"; mm_menu_11_0.menuBorder = 1; mm_menu_11_0.menuLiteBgColor = "#70907f"; mm_menu_11_0.menuBorderBgColor = "#dcebe0"; window.mm_menu_12_0 = new Menu("root",202,24,"","11","#ffffff","#ffffff","#70907f","#99b0a5","left","middle",3,1,300,1,0,true,true,true,0,true,true); // mm_menu_12_0.addMenuItem("
","location='../../../../index.cfm/lev1/2'"); mm_menu_12_0.addMenuItem("D-ODORIT 300","location='../../../../products/?act=pdπd=7'"); mm_menu_12_0.addMenuItem("D-ODORIT 100 OB","location='../../../../products/?act=pdπd=3'"); mm_menu_12_0.addMenuItem("CARBONIL XT","location='../../../../products/?act=pdπd=4'"); mm_menu_12_0.addMenuItem("GRAPE PLUS","location='../../../../products/?act=pdπd=5'"); mm_menu_12_0.addMenuItem("ENVIRO-SCRUB VT","location='../../../../products/?act=pdπd=820'"); mm_menu_12_0.hideOnMouseOut = true; mm_menu_12_0.childMenuIcon = ""; mm_menu_12_0.bgColor = "#dcebe0"; mm_menu_12_0.menuBorder = 1; mm_menu_12_0.menuLiteBgColor = "#70907f"; mm_menu_12_0.menuBorderBgColor = "#dcebe0"; window.mm_menu_13_0 = new Menu("root",202,24,"","11","#ffffff","#ffffff","#70907f","#99b0a5","left","middle",3,1,300,1,0,true,true,true,0,true,true); // mm_menu_13_0.addMenuItem("
","location='../../../../index.cfm/lev1/797'"); mm_menu_13_0.addMenuItem("BULLDOGG","location='../../../../products/?act=pdπd=796'"); mm_menu_13_0.addMenuItem("EZ-STRIP","location='../../../../products/?act=pdπd=33'"); mm_menu_13_0.addMenuItem("PHOS-SCRUB","location='../../../../products/?act=pdπd=36'"); mm_menu_13_0.addMenuItem("TRI-SOLV (oil)","location='../../../../products/?act=pdπd=39'"); mm_menu_13_0.hideOnMouseOut = true; mm_menu_13_0.childMenuIcon = ""; mm_menu_13_0.bgColor = "#dcebe0"; mm_menu_13_0.menuBorder = 1; mm_menu_13_0.menuLiteBgColor = "#70907f"; mm_menu_13_0.menuBorderBgColor = "#dcebe0"; window.mm_menu_14_0 = new Menu("root",202,24,"","11","#ffffff","#ffffff","#70907f","#99b0a5","left","middle",3,1,300,1,0,true,true,true,0,true,true); // mm_menu_14_0.addMenuItem("
","location='../../../../index.cfm/lev1/798'"); mm_menu_14_0.addMenuItem("Si-Foam 10","location='../../../../products/?act=pdπd=798'"); mm_menu_14_0.hideOnMouseOut = true; mm_menu_14_0.childMenuIcon = ""; mm_menu_14_0.bgColor = "#dcebe0"; mm_menu_14_0.menuBorder = 1; mm_menu_14_0.menuLiteBgColor = "#70907f"; mm_menu_14_0.menuBorderBgColor = "#dcebe0"; window.mm_menu_15_0 = new Menu("root",202,24,"","11","#ffffff","#ffffff","#70907f","#99b0a5","left","middle",3,1,300,1,0,true,true,true,0,true,true); // mm_menu_15_0.addMenuItem("
","location='../../../../index.cfm/lev1/835'"); mm_menu_15_0.addMenuItem("pH Controllers","location='../../../../products/?act=pdπd=835'"); mm_menu_15_0.addMenuItem("Flame Arrestors","location='../../../../products/?act=pdπd=836'"); mm_menu_15_0.addMenuItem("Industrial Vapor Hose","location='../../../../products/?act=pdπd=837'"); mm_menu_15_0.addMenuItem("Pails","location='../../../../products/?act=pdπd=840'"); mm_menu_15_0.addMenuItem("Poly Storage Drums","location='../../../../products/?act=pdπd=838'"); mm_menu_15_0.addMenuItem("Liquid Storage Totes","location='../../../../products/?act=pdπd=839'"); mm_menu_15_0.addMenuItem("Poly Drum Pump","location='../../../../products/?act=pdπd=841'"); mm_menu_15_0.hideOnMouseOut = true; mm_menu_15_0.childMenuIcon = ""; mm_menu_15_0.bgColor = "#dcebe0"; mm_menu_15_0.menuBorder = 1; mm_menu_15_0.menuLiteBgColor = "#70907f"; mm_menu_15_0.menuBorderBgColor = "#dcebe0"; window.mm_menu_16_0 = new Menu("root",202,24,"","11","#ffffff","#ffffff","#70907f","#99b0a5","left","middle",3,1,300,1,0,true,true,true,0,true,true); // mm_menu_16_0.addMenuItem("
New All-In-One High-Volume Air Scrubber for Air-Mover and Gap-Vac exhaust. 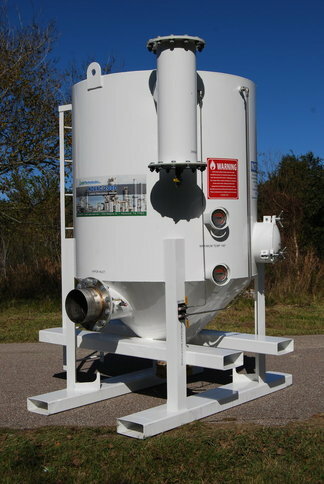 The new E6500-R3K trailer mounted scrubber system is designed for airflows up to 6500 CFM. Excellent for Air-movers, Gap-Vac's and more. Requires no utilities. Unit includes Eliminator 6500 liquid scrubber followed by twin R3K Radial Carbon Bed Adsorbers. Scrubber unit holds up to 1450 gallons of solution which will enable longer run times. In addition, each carbon bed holds 3000 pounds of granular activated carbon (GAC). Each carbon bed has multiple gauges to monitor bed temperatures. Entire unit mounted to 24' gooseneck trailer for easy mobility. System is capable of very high removal efficiencies (99.9%+). 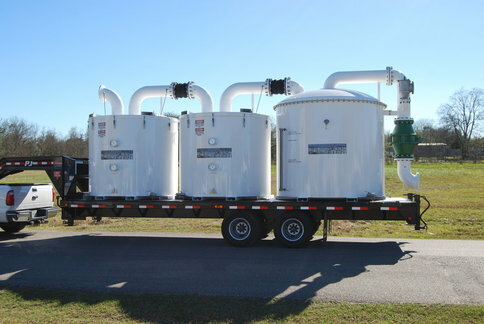 Unlike other systems on the market, this system is designed properly to handle 6500 CFM. Contact Vapor Tech for details. New Midwest and West Coast Distribution Centers! Starting in March, 2017, Vapor Tech will be storing various chemical products at our distribution center in Hammond, IN. Home | Product Details | Customer Case Studies | Company Directory | Distributor Info | Partners | Support Documents | Contact Us | New Customer Credit App. Web design by Ricochet Interactive LLC. © 2019 Vapor Technologies Inc. All Rights Reserved.